Seen at close quarters the intricacy of this lovely wetland wildflower is just amazing. 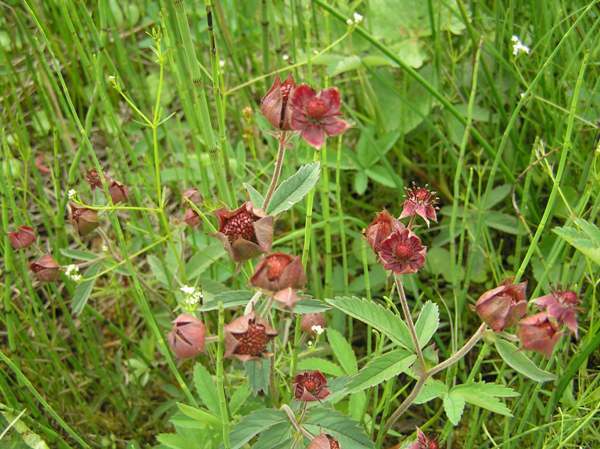 Marsh Cinquefoil has reddish-purple hermaphrodite flowers 20 to 30cm across, with five red sepals that are longer and broader than its five petals. The basal leaves are divided into five toothed leaflets, while leaves nearest to the flowers have just three leaflets. These spreading plants rarely grow taller than 40cm and their roots are often under water. 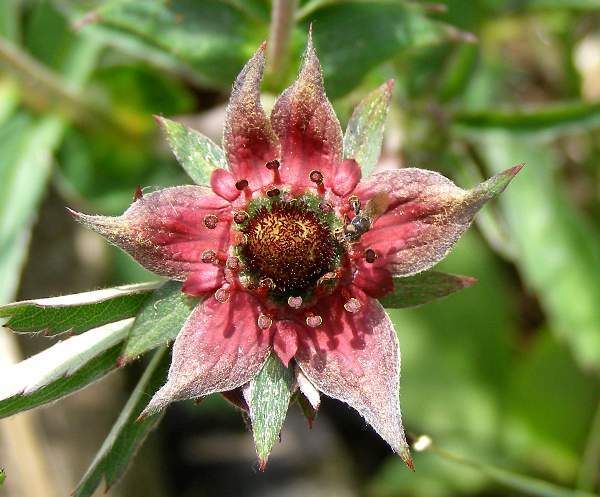 Marsh Cinquefoil, a relatively uncommon sight in some regions of Britain and Ireland, occurs also in many parts of mainland Europe, in northern Asia, and in North America. Comarum palustre is an acid-loving wildflower; it grows mainly in peaty marshes, swamps and fens and in the shallow margins of unpolluted upland lakes. In Ireland some of the high moorland in County Wicklow has Marsh Cinquefoil in ditches and other damp hollows and along the margins of rivers and streams. From early June until late August the ruby red flowers of Marsh Cinquefoil are a great source of nectar for bees and many other kinds of insects that swarm around ponds and other wetland sites.. In the past the roots of this plant were used to dye leather a reddish-yellow colour, and a red dye was produced from the flowers. 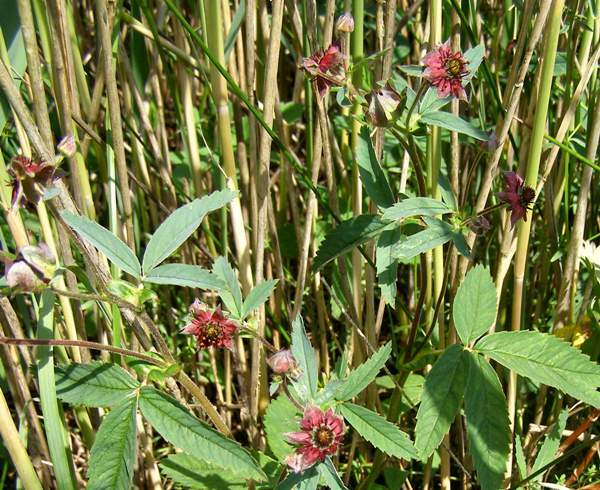 Marsh Cinquefoil leaves are reputed to be good for making tea. Their rarity today makes collecting leaves or flowers of Marsh Cinquefoil not merely difficult but ecologically unforgiveable. Comarum may come from the Latin noun coma, meaning hair (of the head), a reference to the hairy sepals. Marsh Cinquefoil is listed as Potentilla palustris in some field guides, and Potentilla means 'powerful, despite its small size' and is a reference to the claimed medicinal value of plants in this genus. The specific epithets palustre and palustris means of swamps - a reference to the preferred habitat of this wetland wildflower. Other members of the cinquefoil clan have yellow flowers, but Marsh Cinquefoil, arguably the most beautiful of the group and one of the loveliest wetland wildflowers, is unique in having lovely deep red or reddish-purple flowers and so is unlikely to be mistaken for any other Potentilla species. The pictures on this page were taken at Crymlyn Bog National Nature Reserve in South Wales, but if you are in mid Wales you could equally well see it at Cors Caron (Tregaron Bog) National Nature Reserve.